Instant Pot Shepherd’s Pie is an easy way to make a traditional Irish meal quicker and better than before! Historically, Shepherd’s pie originated as a way to use up leftover ground meat and mashed potatoes. Instant Pot Shepherd’s Pie – cooked in the Instant Pot and broiled to perfection. The meat was cooked in a thick gravy with onions with any other vegetables that were available. Most commonly used were carrots and peas. Then cooked mashed potatoes were layered on top of the meat mixture in a casserole dish. The mixture was baked in the oven until everything was heated through and the potatoes were golden brown on top. The result, a fantastic meal created all by using leftovers! Be sure to deglaze the bottom of the pot with a wooden spatula to prevent the BURN notice. In order for it to be called Shepherd’s Pie, ground lamb meat must be used. 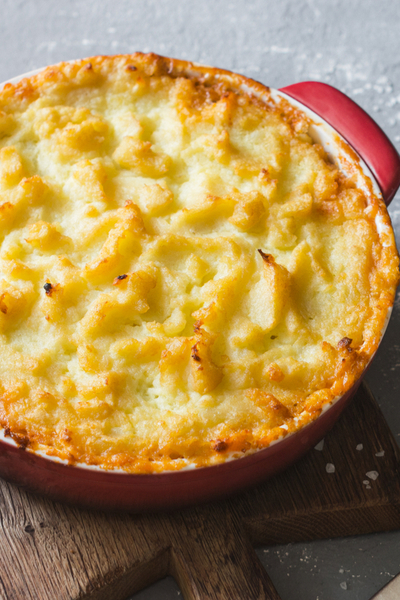 If ground beef is used instead, the actual recipe is named Cottage Pie. However, let’s be honest. To most of us, we use these name interchangeably in many parts of the world. This is often because ground lamb meat is not as easy to find as ground beef in certain geographical areas. 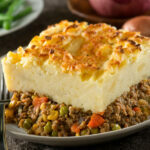 Therefore, most recipes that are made in home kitchens refer to the dish as Shepherd’s Pie, even if ground beef is used. The tall trivet is set down into the meat filling to hold the potatoes. Why Make Instant Pot Shepherd’s Pie? You may be wondering why you would make Instant Pot Shepherd’s Pie? The answer is simple. Although the original recipe calls for using leftovers, this recipe is made from fresh, not yet cooked ingredients. However, there are times that you simply want Shepherd’s Pie and you don’t have any leftovers. In addition, the Instant Pot will save you the time and hassle of making this dish using several pots and pans. Whole, peeled Russet potatoes on top of the tall trivet. If you are new to the Instant Pot, you will find this article helpful: Beginner Tips To Using The Instant Pot. Making Instant Pot Shepherd’s Pie is extremely easy. The meat is browned and vegetables are sauteed directly in the liner of the pressure cooker. But the best part of all is that the whole potatoes are added on top of the filling mixture and cooked at the same time! 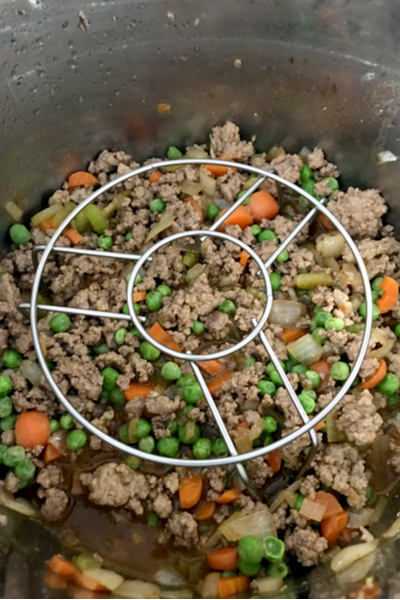 Simply place a tall trivet or a tall trivet and steamer basket over top of the meat mixture and pressure cook. 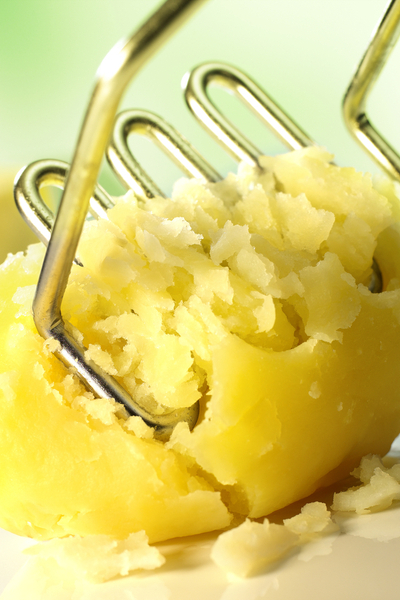 Remove the cooked potatoes and use a potato masher for perfectly cooked mashed potatoes! Once the time expires, simply remove the potatoes and mash using a potato masher. If you want to serve Shepherd’s pie the traditional way you will need to transfer the mixture to a casserole dish. Place the meat mixture in the bottom of the pan and layer the potatoes on top. Then drag the tines of a fork across the top of the mashed potatoes to give it the classic textured look. Broil the hot mixture until the potatoes begin to turn golden brown. Remove from the oven and serve! If you want traditional shepherd’s pie, finish it off in a casserole dish in the oven. . However, if you are truly just wanting a one pot, easy to make meal, you can skip the broiling process. 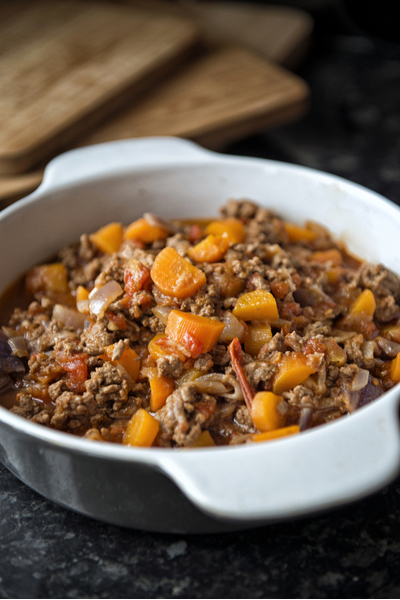 Simply serve the mashed potatoes alongside the meat filling for a satisfying, one pot meal! If you love this recipe, you will love our Irish Colcannon recipe as well. Check out some of our other favorite Instant Pot Recipes at our Instant Pot Recipes Page. 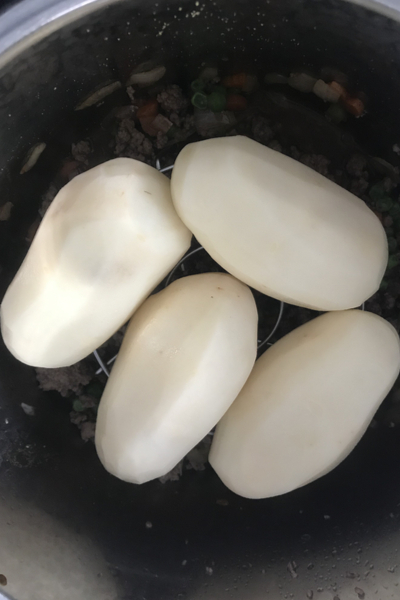 Shepherd’s pie filling and potatoes cooked in the Instant Pot and then broiled in the oven to brown the topping to achieve the traditional look. Select the Sauté setting on the Instant Pot and when the display reads HOT, add the olive oil. Add the ground lamb (or beef) and sauté until cooked through. Using a slotted spoon, remove the cooked meat and place in a bowl and set aside. Reserve a tablespoon of the fat in the liner of the pot and discard the rest. 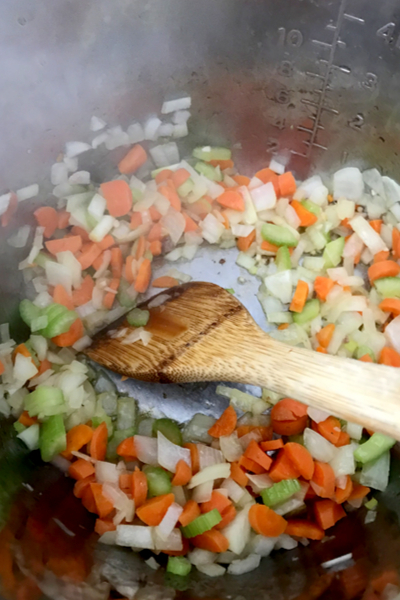 Add the onion, celery, carrot, garlic, and 1/2 teaspoon of the salt to the pot and sauté until the onion is translucent, approximately 4 minutes. As this mixture cooks, scrape the bottom of the liner to remove any stuck bits from browning the meat. Stir in the thyme, pepper, tomato paste, and Worcestershire sauce. Cancel the Sauté cooking mode. Return the cooked meat to the pot and add the vegetable broth and peas. Place a tall trivet in the pot. Place the potatoes on the rack. Hint – if they are large potatoes, be sure to cut them in half horizontally for proper cooking. Lock the lid in place the turn valve to the sealing position. Pressure Cook/Manual on HIGH for 15 minutes. When the cooking time ends, perform a quick pressure release by slowly moving the valve to the venting position to release the steam. Carefully remove the lid and transfer the potatoes to a bowl, set aside. If the meat mixture seems too thin, place the pot on saute mode and let the liquid evaporate as you mash the potatoes. To the potatoes, add the milk and 3/4 teaspoon salt and use a potato masher to mash the potatoes until smooth. Add additional salt and pepper to taste. Stir 1/2 cup of the mashed potatoes into the meat mixture in the pot. Transfer the meat mixture to a broiler-safe 8 inch baking dish. Spread the mashed potatoes on top. Using the tines of the fork, make ridges along the top surface of the potatoes. Broil the shepherd’s pie until the potatoes are lightly browned. Approximately 5 minutes. This dish also can be served without the broiling process if preferred - serve the meat mixture alongside the mashed potatoes.